Based on the literature and the author’s own experiences in the field, the study presents the shamanism of the Eastern Khanty people, who live near the Rivers Tromagan and Agan, tributaries of the River Ob. I provide the text of a shaman ritual performed in 1987 and a translation with possible explanations. The protagonist of this ritual is Ivan Stepanovich Sopochin, one of the most remarkable Surgut area shamans of the 20th century. The initiator of the ritual was Regina Nazarenko, an ethnomusicologist from Russia, who analysed the ritual from a musical perspective; however, her research was discontinued due to her early death. The paper traces the history of a formerly unidentified shamanic drum back more than a hundred years. It reveals who was the last user of the drum; who might have continued to use it had he not been too fearful of doing so; and the ethnicity of its maker. In addition, the drum provides a good example of the nature of interethnic transmission and borrowing of objects: a people is always willing to borrow ritual objects from another whom it regards as transcendentally more powerful, and it comes to consider these objects as its own to the extent that in a few generations the actual origin of the object is forgotten. It is also shown that, in the case of the almost entirely assimilated Khantys of the Vasiugan River, a 120-year-old photograph of an ancestor that is now kept in a foreign museum may become extremely important for the group’s self-representation. These people’s concept of the soul leads them to consider photographs as living things with which one can communicate. Finally, the paper deals briefly with the stereotypical image of the Evenkis: for both the Khantys and the Russians the Evenkis represent the often ambivalent image of the “savage,” with all its positive and negative connotations. The present account discusses the close relationship between two important elements of Kirghiz popular beliefs, the so-called sacred mazar sites and the shaman (bakši). During our field trip in the Xinjiang Uighur Autonomous Region of China in 2004 we visited the sacred valley of Jay Ata, which offers a good example of the mixture of animism and Islam. The animist worship of nature and the popular Islamic respect for the tombs of holy personages is combined in the Kirghiz concept of mazar sites. Later we witnessed a unique healing ritual of a Kirghiz shaman. During this ritual the shaman performed a dance (talma biy) that has already disappeared among the Kirghiz population of Kirghizstan. We were also able to observe the use of the shaman’s flag (tuu), which symbolized his travel to the Upper World. 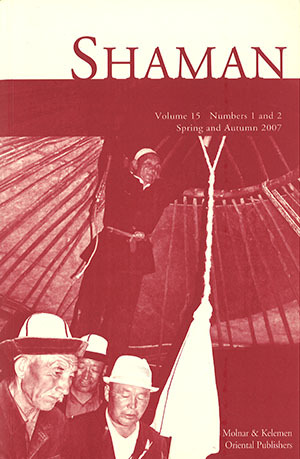 This article presents interviews with the shaman and the guard of the sacred valley, a written source on the Islamic legitimization of the valley and a musical analysis of the shaman’s song. Analysis of the shamanic ritual also reveals a strong link between the ritual and the mazar sites. In examining the shamanic ritual texts of the Darkhads and Oirads, the author recorded several life stories and numerous other data concerning the shamans’ and shamanesses’ ritual and beyond ritual activities. These valuable data help us to investigate the texts and to understand them in the ritual context. During her fieldwork an enquiry pattern emerged from the materials that can serve to establish a multilateral approach to both shamanic activities and the texts themselves. The model for presenting the shamanic activities comprises among other things the personal data, the masters, the ritual objects, the shamans’ taboos, and the interaction between the shaman and his human and spirit community. The main areas of the activity of five shamanesses will be introduced according to the established enquiry pattern. This study endeavors to present the main features of Buriad shamanism practised in Mongolia. Most of the data was collected during the academic year 2004-2005 in Ulaanbaatar with the aid of my two informants, the shamaness Altanceceg and her assistant Dawuujin Namsarai, who both reside in Dornod province, Eastern Mongolia. 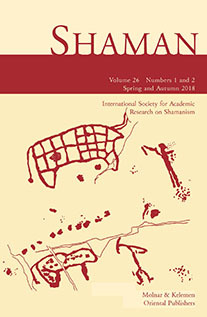 The texts that appear in this article, which are samples from the inexhaustible source of Buriad shamanic poetry and oral tradition, are compared to those published and translated by György Kara and collected by G. Gantogtox and Jawjan Coloo from another Buriad shaman, Coijiliin Ceren. Some details of the Buriad shamanic initiation ritual, the paraphernalia, the sacrificial altar, etc., have been provided by other informants and are compared with those given by Altanceceg and Dawuujin Namsarai. This short study discusses the first appearance of the word ‘shaman’. A gloss in the Song dynasty Sanchao beimeng huibian equates the Jurchen word shanman with the Chinese wuyu. The context and these terms are investigated to elucidate the exact meaning of this reference. Earlier theoretical research concentrated on the personage of the shaman and less on his or her cultural background, system of beliefs and world concept of shamanism. By researching the myths and epics of the Tungus, Mongolian and Siberian Turkic peoples, the author became familiar with the religious concepts and world image of these peoples from the inside, from an “emic” point of view. It is characteristic of this animist religion that beside the threefold World there is another parallel world, which exists in the form of myths and epics. The shaman as master of souls and spirits had important functions in connection with this parallel world. EDE FRECSKA (Budapest) and LUIS EDUARDO LUNA (Florianópolis, S.C., Brazil and Helsinki, Finland): The Shamanic Healer: Master of Nonlocal Information? The prevailing neuroscientific paradigm considers information processing within the central nervous system as occurring through hierarchically organized and interconnected neural networks. The hierarchy of neural networks doesn’t end at the neuroaxonal level; it incorporates subcellular mechanisms as well. When the size of the hierarchical components reaches the nanometer range and the number of elements exceeds that of the neuroaxonal system, an interface emerges for a possible transition between neurochemical and quantum physical events. ‘Signal nonlocality,’ accessed by means of quantum entanglement is an essential feature of the quantum physical domain. The presented interface may imply that some manifestations of altered states of consciousness, unconscious/conscious shifts have quantum origin with significant psychosomatic implications. Healing methods based on altered states of consciousness and common in spiritual or shamanic traditions escape neuroscientific explanations based on classical cognition denoted here as ‘perceptual-cognitive-symbolic’ (characteristic of ordinary states of consciousness). Another channel of information processing, called ‘direct-intuitive-nonlocal’ (characteristic of non-ordinary states of consciousness) is required to be introduced for interpretation. The first one is capable of modeling via symbolism and is more culturally bound due to its psycholinguistic features. The second channel lacks the symbolic mediation, therefore it has more transcultural similarity and practically ineffable for the first one, though culture specific transliteration may occur. Different traditional healing rituals pursue the same end: to destroy “profane” sensibility. The ritual use of hallucinogens, the monotonous drumming, the repeated refrains, the fatigue, the fasting, the dancing and so forth, create a sensory condition which is wide open to the so-called “supernatural.” According to contemporary anthropological views, the breakdown of ordinary sensibility/cognition is not the ultimate goal, but the way to accomplish healing, that is psychointegration in the widest sense. From the perspective of system theory, integration needs information to be brought into the system. According to the presented model, when the coping capability of the ‘perceptual-cognitive-symbolic’ processing is exhausted in a stressful, unmanageable situation, or its influence is eliminated by the use of hallucinogens or in case of transcendental meditation, a frame shift occurs, and the “spiritual universe” opens up through the ‘direct-intuitive-nonlocal’ channel.